I think the one item to make the largest impact in a bedroom is the bedding. 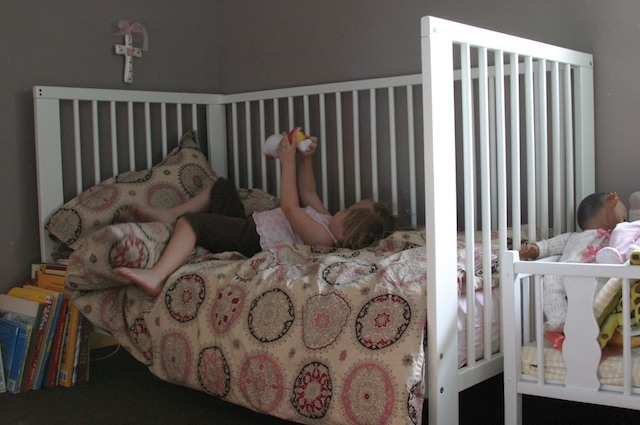 For example, P has an Ikea crib/toddler bed with Dwell bedding. The bedding makes the $99 crib look so much more sophisticated. Kid’s bedding is so awful and the good stuff is so overpriced. There is a wide open gap in this market for someone to produce well designed, moderately priced and useful bedding. The Dwell set that we have has worn terribly. The comforter has been washed many times and the color has faded quite a bit. The bumper and skirt have not been washed as much and there is a huge color difference between the comforter and the other two pieces. This is not what I expect from $350 bedding! We’re going to keep P in her toddler bed which was her crib. We’ll get her a twin bed, probably a bunk bed, when we have a second child and need the crib again. However in the meantime the bedding is not fitting her. P rolls over once and the comforter is totally off of her. I searched for a duvet and cover in toddler size but couldn’t find one I liked that was under $100. Basically they don’t make duvets for toddlers, only comforters. I believe children should have the same quality of sheets as we do which is why I wanted to get her a duvet. Once again, I couldn’t find what I was looking for so I made my own. I went to Ikea and bought a twin size duvet and cover. I came home and cut both in half and sewed up two sets. 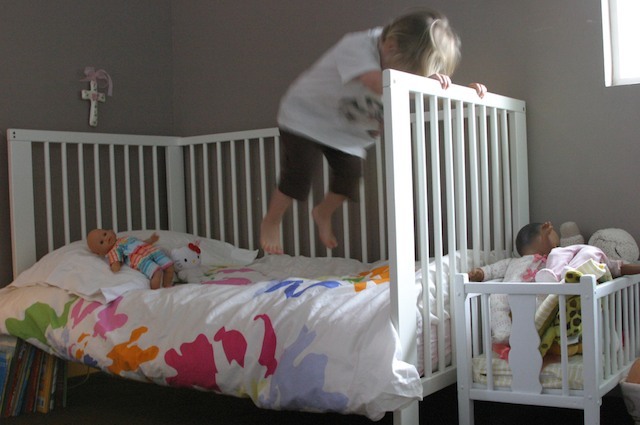 A twin size duvet folded in half is the perfect size for a toddler bed. For $45 I got two sets of duvets for P’s bed. Perfect. Now if she has an accident in the middle of the night I have a spare set I can quickly change. 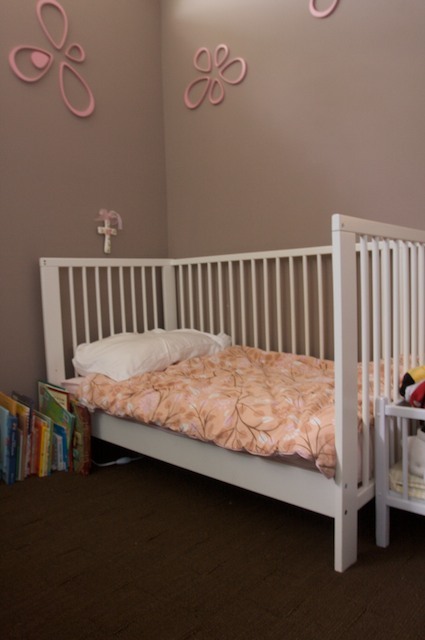 Before P was born I knew I wanted her nursery to be brown and pink. We ended up painting her room in a tan and Tiffany blue with pink accents and white furniture. I found a bed/sofa cover at Target one day for $20. I loved the pattern but wasn’t sure what to do with the material. It reminded me of bedding from Serena & Lily, which I love so much so I bought it. I can’t afford Serena & Lily bedding on sale so this was a score find. I figured eventually I’d have a use for it. That day has come. I pulled the fabric out from deep in the closet and made a duvet cover and pillow sham for P’s toddler bed. It’s her favorite cover. Designing children’s bedding may be my new business when it’s time to go back to work. A few tips if you decided to cut a feather filled duvet in two. My dining, laundry and bedroom looked like a chicken coop when I was finished because of mistakes I made. 1. if you have a clothes line, hang the duvet from the clothes line at the point where you plan to split it. 2. Smack the duvet as if you were cleaning a rug so that the feathers settle to either side of your planned cut line. 3. Take your duvet back to your sewing area. Try to keep it from shaking around much as you’ve settled the feathers into their proper place. Mark your cut line. 4. Sew up and down to the left and right side of your marked cut line. This is the tough part. Trying to pass half a duvet through the space of a sewing machine that’s between the needle and the body of the machine is a bit tough. However, sewing these lines will keep you from having feathers all over the place. 5. Cut between your two newly sewn lines.